When Safoura came to Poland she didn’t know the language but she knew she wanted to study veterinary medicine. After four years, not only does she speak fluent Polish but she’s also just won the INTERSTUDENT competition for the best students studying in Poland. The list of her credits and activities is lengthy: 4ᵗʰ year’s veterinary student, member of the management of Students’ Government’s at WUELS, vice-president of Students’ Government at the Faculty of Veterinary Medicine, initiator of appointing a foreign students’ representative in the Students’ Government, member of Committee of Didactics and Education Quality and Faculty’s Committee for Provision of Education Quality. She founded a help & support group for students from other countries who, like her, are studying veterinary medicine in Polish. She’s actively involved with the Student Research Group for Exotic Animals ”Mephitis” and with the International Organization of Veterinary Medicine Students. 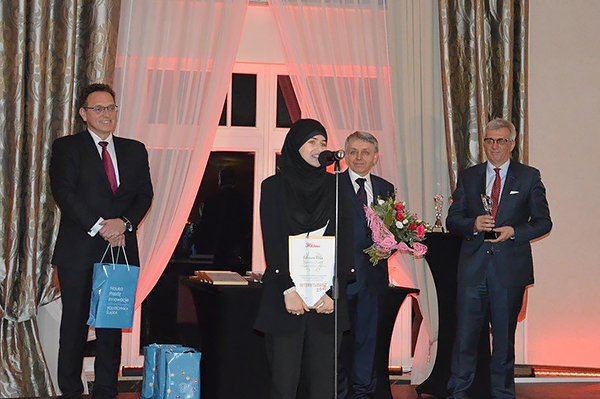 With her thesis on examination of cancer cells she won the first prize during the 22ⁿᵈ International Conference of Student Research Groups. She coorganized the 3ʳᵈ and 4ᵗʰ edition of the International Forum of Medicine and Veterinary Parasitology. She has been conducting research on dogs suffering from dysplasia, she’s also been developing methods for detection of Giardia duodenalis parasite using the PCR method. She’s a volunteer at a veterinary oncology clinic and a RTG workshop for animals. 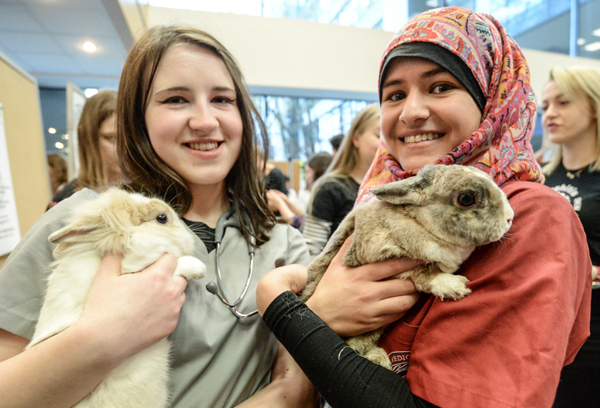 She’s been promoting veterinary medicine among future students. And all of the above is contained in one person. Safoura Reza came to Wrocław from Lyon, France. Her parents come from Afghanistan. – The beginnings were difficult, I didn’t know the language and my looks and my religion cause different reactions. I was afraid people would hate me here. Fortunately, I then enrolled at the university and met lots of fantastic people, both students and lecturers – says Safoura, who won this year’s edition of INTERSTUDENT competition in ”Master’s degree” category. The goal of the competition is to select, reward and promote the best foreign students studying in Poland, enrolled in Bachelor’s, Master’s or doctoral degrees. – She’s a student who is heavily involved with both the university life and her field of study. I know no other student who would dedicate so much energy, creativity, and time to the faculty, and at the same time to their own scientific development – said the rector Tadeusz Trziszka while recommending Safoura. – I love animals, all of them. Whenever we have classes about cows I keep thinking I’m going to work with cows in the future, when it’s classes about sheep I keep thinking I’m going to focus on sheep, it’s the same thing with horses – the student laughs and adds that if possible, she would also like to get a doctoral degree as she loves working in laboratories. She’s particularly interested in tumours. – For the rest of my life I will remember the first time I came home after class and cried. I didn’t understand a thing, and the students around me kept taking notes, page after page. Later, the other students spent 15 minutes studying right before taking a quiz, I spent three hours. So I just needed to learn Polish. And I needed to do it fast – Safoura also admits she received a lot of support from the lecturers who would ask how they could help her, whether she preferred to take oral or written exams, and, whenever she needed, they would explain to her things she had a hard time understanding. – It’s one of the things that kept me motivated, I studied a lot more in order to speak better and not let them down. Though I have made a couple language mistakes – someone once asked me whether we eat cats as part of my culture (weird question, by the way), and I heard ”have” instead of ”eat”, so I started explaining earnestly to the entire group that yes, of course, we do.